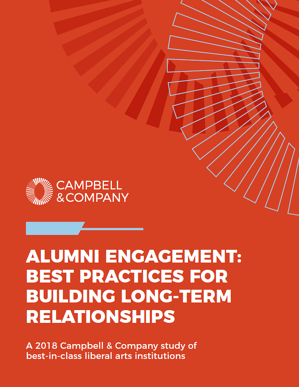 Based on our conversations, we compiled a comprehensive series of strategies that your team can leverage as you work to deepen your connection to your alumni. We also developed a proprietary tool to help you evaluate the maturity of your alumni engagement program. Building a strong program can take years, if not decades. However, we found that by making it an institutional priority and following best practices, advancement teams can institute the organizational changes and cultural shifts necessary to set themselves on the path to success. If you have questions or would like to discuss the research, please don't hesitate to email me at caitlin.bristow@campbellcompany.com.